Leave the crazy city traffic behind by starting the Northwest Motorbike Tour from western outskirts of Hanoi. After two hours riding, we will be in the mountain area have enjoyable time to feel breathtaking landscape of Halong bay on land with the rice paddies between limestone mountains. Keep striking northwest and cross two passes and then dropping down to the beautiful valley of Mai Chau. 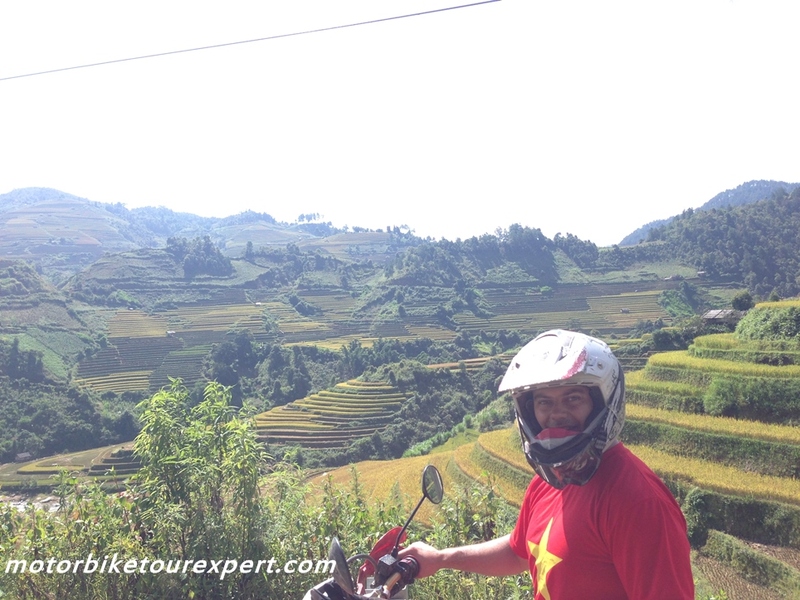 This is the short motorbike ride today from Hanoi but it should be one of the best motorbike ride in north Vietnam. We will finish the ride in Mai Chau valley at 5 PM and stay overnight with friends of the White Thai minority in a traditional house on stilts. In the evening, after feasting, we can enjoy a cultural show of Thai dancing and a range of special local liquors. Continuing the Northwest motorbike tour Vietnam on the almost empty Road 37 we enter mountains heavily populated with Black Thai people, who work on large terraced rice fields. The winding road passes through many Thai villages and fields and provides a great opportunity to watch country life passing by. We continue through rolling hills before rising up to the sugar cane growing areas on the cooler plateau Son La. 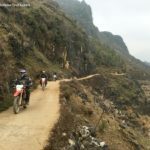 This Northwest Vietnam motorbike tour to Son La is another easy ride but you won’t feel boring because you will see many things in difference from the mountain view of 2 days before. Keep heading to northwest from Tuan Giao the road passes isolated communities of Hmong and Thai people, whose small villages settle on the banks of dark green rivers and on the steep slopes of the mountains. After lunch by a forest stream the road begins to climb up the high Sa Tong pass. At the top for sunset before dropping sharply into the deep Lai Chau valley. Muong Lay town was sunk in early 2010 and our new place for accommodation is Sin Ho, a small remote town. Day 7: Fresh Body Up in Sapa. It’s a relaxing ride on a winding road with a nice mountain and lake view. 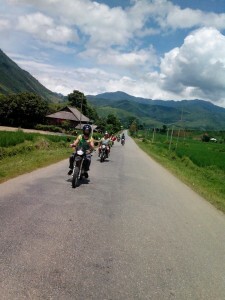 This north Vietnam motorbike tour to Thac Ba lake is almost on the rugged road a long the lake. 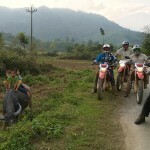 We finish the motorbike ride by noon at the village of the Dzao people who located on the Thac Ba lake bank.